It started as the latest craze, now it's part of our culture. So, you you have no choice but to invite your friends over for a SURVIVOR soiree! Think of it as having your own little island--in your own backyard. Gilligan would be proud (although he admits he wouldn't have lasted a day). It's a clever show, and an even cleverer (is that a word?) party--so an incredibly clever invitation is in order. 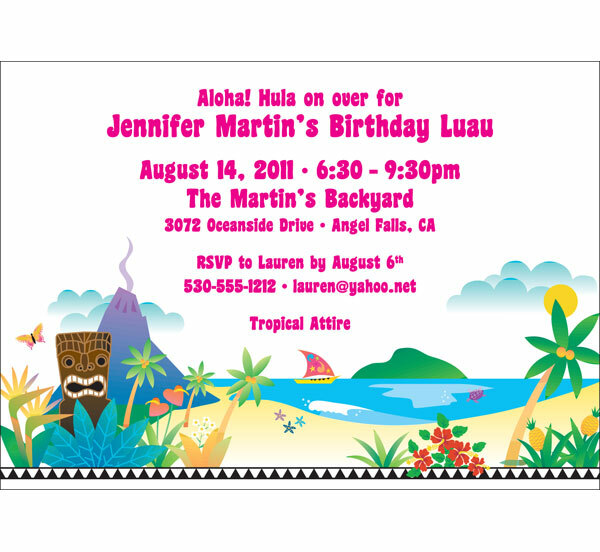 I suggest a personalized island luau invitation, a tiki torch invitation or a caricature invitation from Party411. Invite your guests to your "island" to tape the ONLY episode. Make sure to give your island a name. (Pick someplace exotic.) Tell them what to wear (island clothing, rubber-soled shoes--allow only two items extra), what to bring (water and bug spray sound good-have you seen those Survivors' legs? !--allow only three items), where to go and when to arrive. On your RSVP, make sure you ask them if they want to participate or spectate (this is very important!). When your RSVPs arrive, divide them into three piles: Tribe 1, Tribe 2 and the Production Group (these are your spectators a.k.a. the party poopers--they can do the video). You may want to divide teams by men and women--or not. It's up to you how you pick and choose. Make the assignments before the event (you don't want anyone to feel left out like they did in elementary school when choosing sides for softball, now do you?). Put your registration area inside the front door. Have signs posted: we do not practice island politics; you are now entering island society--be gracious; etc. See the Party411 Luau party for more great ideas and products to set the tropical tone of your bash. Add in treasure maps and sea shells around the party for sure! Set up a luau of sorts. We have loads of luau suggestions on the site--so go for it. Roast a pig. Make it a wild pig (after all, you can pretend you caught it right there). Check out our Luau recipes page. Serve your drinks in a SURVIVOR shot glass (only $5 on the Survivor website--and a great souvenir--plus it's the least expensive). As guests arrive, welcome them to your "island" (maybe a lei or two) and assign them to their tribes. Some suggestions for tribal names are: Snake, Rattle and Rollers, Boogie Bugs, Lounge Lizards, Shell Shockers. Alright, maybe they're not all that creative, but they work. You may want to provide color armbands or t-shirts (like they do in color wars) so everyone knows who's on which side! You can even pass out face paints so they can decorate themselves as a tribe. Lest they conspire with the wrong tribe. Once everyone is settled, it's time to get on with the immunity challenges. Obviously, you are not really on a deserted island, so you'll have to be a little more inventive than those guys at CBS (plus I think your budget is a tad less). Unless you never want to see your friends again, I suggest staying away from things like bug eating competitions and such (unless you use gummy bugs, or rats!--now that's okay and the only side effects are a sugar high). Whichever team wins each challenge should get points. Forcing the other team to vote someone off (out of the tribe) would probably be a touch insensitive seeing as how these are your friends and by, say, 9 p.m. you could be partying with one or two people. How much fun is that? The team with the most points wins! Enough said. A gummy bug-eating competition. He who eats the most, wins. Gummy bears are a big favorite of mine, but don't go with the theme. Try gummy spiders and beetles and stuff like that. A rat hunt. Candy stores also have gummy rats (I kid you not). Hide some of those suckers in different places on your "island." A treasure chest relay. They have to carry a treasure chest filled with rocks, back and forth, handing it off to different team members until they are done. A limbo contest. Order a limbo kit and see how low can they go. If you don't think this is dangerous (and hilarious) you've never seen me try to shimmy under a limbo stick. For more exciting challenges, see our survivor games page. After all is said and done challenge-wise, invite your friends to dine and dance. Make a great campfire. Do the limbo. Depending on your budget, you may want to reward the winning team with SURVIVOR t-shirts or hats ($17-18 each). Sit down and watch the video. That should be fun. As a thank you for coming, send each friend a copy so that they remember what a great time they had on your island (or if you don't like them, charge $10 each--CBS makes money, why shouldn't you?). Well we always love a personalized chocolate bar wrapper and we have one that would go with this theme, the Tiki torch candy bar wrapper. Also check out our Island luau mint and candy tin. Leis, luau bucket hats and Hawaiian maracas are also great party favors. Have fun and don't get voted off!